The Japanese have always been nature and landscape lovers. Their gardens have always been inspired by the natural greenery of Japan, creating peaceful, meditative places. Japanese garden styles have also been inspired by old Chinese culture and garden styles. They are very traditional but different and connected with everyday life. Walking gardens, big gardens with a lot of different buildings which would create one big concept. Ponds and water were often used to connect aspects of the garden with each other. 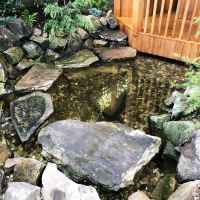 Even though there are a few different types of Japanese garden, there are elements that bring them all together. All the gardens would contain natural rocks, natural paving stones, stones that would not only be a decoration but also could be used (like a bowl shape to wash the face etc. ), ponds and jets, islands, cascades, bridges and hills. All of would be dressed in greenery. Most of the chosen tree species would be evergreen. The most popular plant was pinus, which is a symbol of long life. The other popular big plants choices were: Abies, Thuja, buxus, ilex ligustrum nad oak. Sometimes for the colour interest the not evergreen plants would be used. The most popular were acers but it was easy to find also: prunus, magnolia, camellia, wisteria, peonii tree, hydrangea, rhododendron, jasmin, kerria or daphne. Smaller plants could be found easily: irises, lilies, aster, narcissus, peonii, anemone. Japanese gardens are made to replicate nature in small scale, that’s why all the trees and bushes would be pruned in very special way to make them look natural and interesting - exactly how they look in nature.